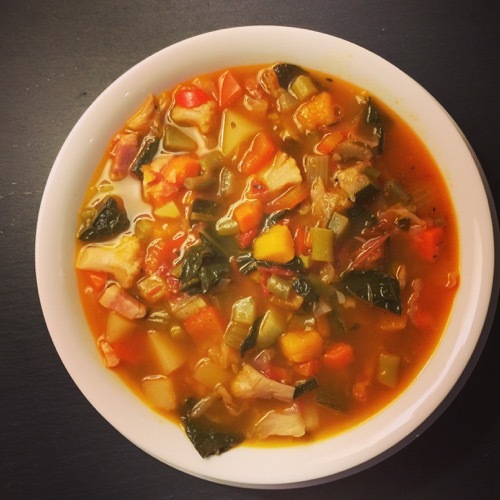 I have written about vegetable soup before, but without firm recipes, as mine changes with whatever is in the fridge or I find in the market. 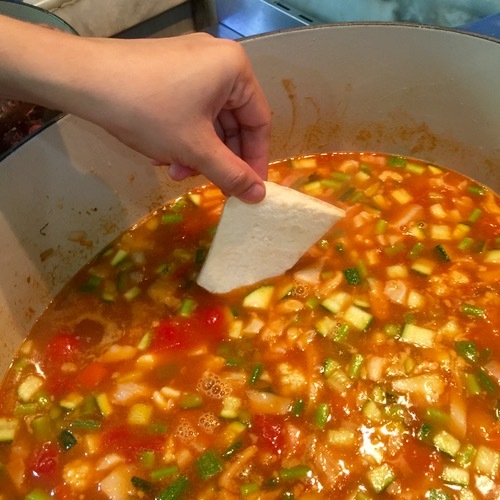 But here are some of my tips and tricks for a really hearty and tasty vegetable soup. 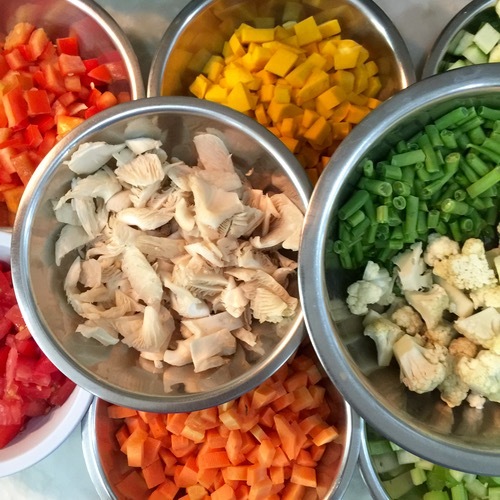 First, start with a wide variety of ingredients, the more the merrier, almost. Don’t throw everything in your fridge into the mix, there has to be a bit of method to the madness. I usually have onions, carrots and celery. I add some cubed potatoes and sweet potatoes when I have them. Green beans or overgrown haricots vert are another staple, as is cauliflower, occasionally broccoli, mushrooms, cabbage, kale, etc. Kalabasa or kabocha squash, zucchini (green or yellow), tomatoes, red bell peppers, etc. all work as well. 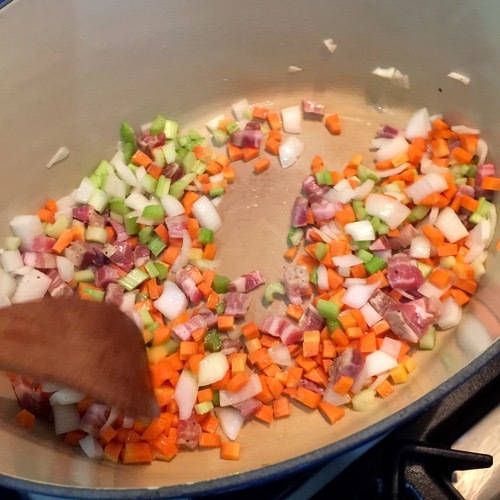 Start with your fat (olive oil for me) and the pancetta, carrots, onions and celery. Let this saute for a good 10 minutes until they are well cooked, and a bit of brown stuff shows up at the bottom of the pot. 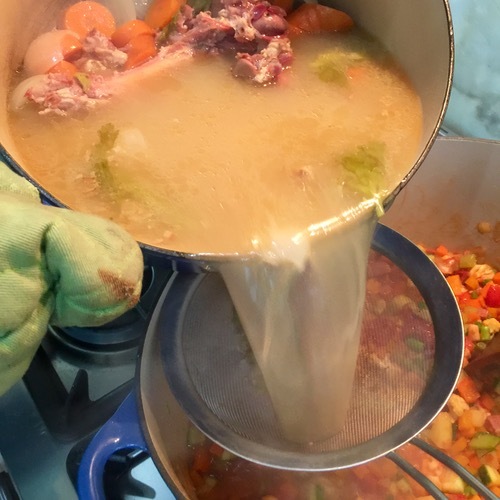 I use a heavy enameled cast iron pot to make my soup in. I find many cooks aren’t patient with this step, the sweating of the veggies, and rush through it. For me, it is the first essential step to eventual depth in flavor. Don’t rush it. Add some of the other harder veggies like sweet potatoes and green beans and saute for several minutes more. Slowly add all the other veggies besides the greens and saute further. I used some leftover white wine in the fridge to de-glaze the pan and a small tin of canned Italian cherry tomatoes as well. At the end of the lengthy saute, perhaps as long as 20-25 minutes in total depending on how large of pot of soup you are making, the veggies should look good enough to eat as is. Vibrant, fragrant and softened. If you’ve ordered veggie soup at restaurants and find that its has hard-ish veggies in a watery flavorless broth, they skipped this lengthy saute phase. It happens even at our restaurant, and it freaks me out no end. Next I add a freshly made broth with ham bones, onions, celery and carrots that is another key step for building flavor. I always buy the ham bones from grocery ham vendors and stock them in our freezer so I can make a ham broth whenever we need it. The bones are the cheapest natural way to build depth of flavor, and it beats canned chicken or other broths by a mile. If you don’t want a pork-based broth, then a good chicken stock is a great alternative. My final trick is to put one or two rinds from used up parmesan cheese. You can store these in your freezer as well until you make a pot of soup. It’s like the best and most natural source of umami. I add the chopped herbs about 10 minutes before finishing off the soup, with the cabbage and kale put just minutes before turning off the flames. This is delicious served up shortly after cooking. But honestly, I think it tastes better much later in the day or the next day even. 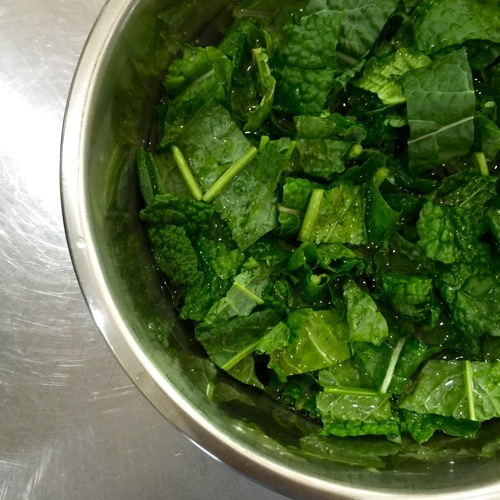 if you plan to serve it later, it’s a good idea to hold the kale or other leafy greens until you are about to serve them, so there’s a bit of freshness to the texture and taste of the soup. I find great comfort in cooking up a huge pot of vegetable soup. First, all that chopping is therapeutic. 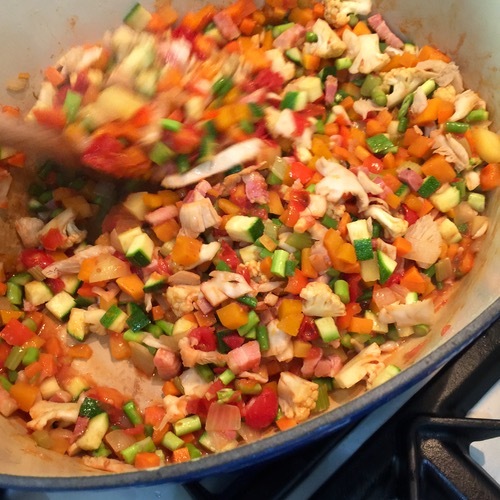 Second, extended saute is mindless and soothing, but critical to the outcome. The homemade broth is amazing to behold — for so little work, it creates such a flavorful base. And the end result, a hearty flavorful soup is so well worth the effort. 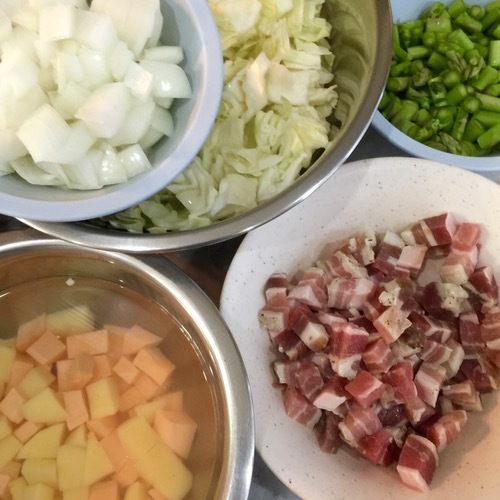 With the local rainy season just starting, I expect to make several batches of soup in the months ahead. Very filling for someone on diet ?? Great tip about the parmesan rinds, and yes, couldn’t agree more about ham bones or ham hocks for miles and miles of flavour. Great broth is key. That really looks delicious! most of the leftovers in my fridge find their way into omelets or soups like this – 2 pieces of bacon, half a porkchop, etc. i like adding italian seasoning or a combination of herbs, even curry seasoning (then it becomes mulligatawny, sort of). 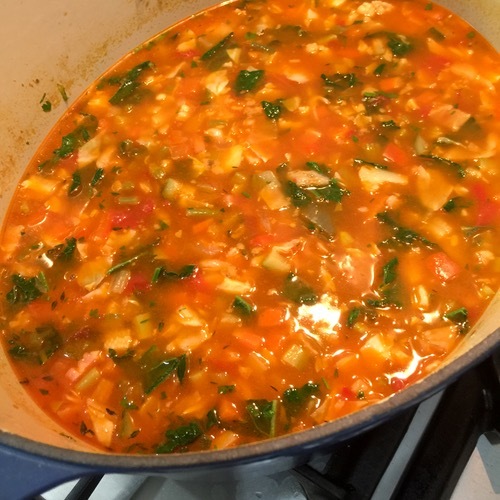 sometimes i add a cup or so of Red Mill Vegetable Soup Mix – it has assorted beans and grains and my favorite, alphabet pasta. Bookmarking and will try a vegetable broth sometime soon. I’ve tried my hand with bone broths as well for the purported therapeutic effects; simmering the bones for 12-20 hours breaks down the collagen and leeches all the minerals from the bones into the broth. The meat on the bones comes out really tender and can go with the broth. Or you can just plop in some frozen dumplings/gyoza while heating up the broth and you’ll have a full meal in a jiffy. Bone broths supposedly can re-mineralize your teeth (fight cavities with bone broth! ), make you hair healthy and shiny and make your skin more supple (because of the collagen). vegetable soup looks yummy will try vegan !